A Toddler Skin Rash Could Be Irritating And Painfully Bothering Your Child. A toddler skin rash is no fun, but it happens more often then you’d think. Skin rashes don’t mean any one thing: they can be caused by temperature, environment, or sickness. They may be perfectly benign or a first symptom of a problematic disease. There are so many possible reasons for a skin rash it would be impossible to go into them all here; but on this page we’ll focus on some common rashes it is likely your toddler will experience at some point. You should be aware this is not medical advice and I am not a doctor; on the contrary, this toddler skin rash page, like all Toddlers-Are-Fun information, is simply informal mother-to-mother advice. It is a hot summer day and you notice small, raised red dots on your toddler’s neck, back, or behind his ears. He may be scratching and uncomfortable. Though your first response may be to call the doctor, you probably don’t need to worry—it is likely to be prickly heat, a benign response to overheating. Your little guy just got too hot. Put him in loose, light clothing and bring him to a cooler place if possible. If you have a little girl, put her hair up in warm weather: she doesn’t need to wear a scarf. Prickly heat is uncomfortable but nothing more, and it will go away by itself. This toddler skin rash may develop anywhere on the body, especially on areas where there is a lot of sweating. You and your toddler are at a birthday party and he is playing, eating, and having fun when suddenly you notice five enormous welts blowing up on his arm. What is happening? It may be that he is allergic to something he just ate, touched, or smelled. Allergic rashes can take a variety of forms, but they are usually red, raised and itchy. They may be localized or spread over the whole body. They often appear- and disappear—very quickly. You can give your child an appropriate dose of an over the counter allergy medicine like Benadryl, but you need to also find out what is causing the allergy so that you can avoid it in the future. If your child has swollen lips, difficulty breathing or is confused or light headed you will need to take him into the emergency room immediately. Eczema is a recurrent toddler skin rash common in young children. In fact, so many toddlers deal with it that I’ve written a special page with information and advice on dealing with it: Toddler eczema. Does your toddler have a slight fever, complains of his mouth hurting while he eats or simply refuses food, and has small blisters on his hands and feet? If so, e probably has hand, foot, and mouth disease, a common childhood illness. There’s not much you can do for this sickness other than giving your child ibuprofen or Tylenol to help him feel better and making ph-neutral, easy to eat foods (think: baby rice cereal). The good news though is that the disease won’t do him any real harm and it will run its course within ten days. Hand, foot, and mouth disease is very contagious among little children, so you should keep your toddler away from other children until he has had no fever (and needed no Tylenol or Ibuprofen) for at least 24 hours. 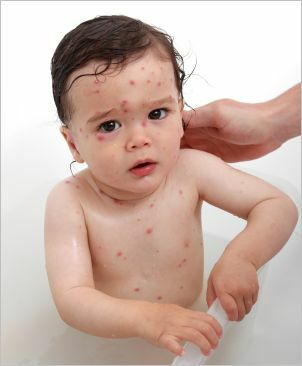 Chickenpox is one of the traditional childhood diseases that every child had to get—once. Nowadays many children avoid it with a vaccination, but if you haven’t had a chance to get vaccinating or decided against the shot your toddler may break out one day in little red dots that become oozing blisters. Chickenpox is not dangerous, though the spots are itchy and uncomfortable and your toddler may feel generally unwell or have a slight fever for a few days. He is contagious for several days before the rash starts, and until all the spots have crusted over. You can give him Tylenol for the fever, and paint his spots with calamine lotion to help make them less itchy. Sometimes what we consider to be a toddler skin rash is nothing more or less than insect bites. 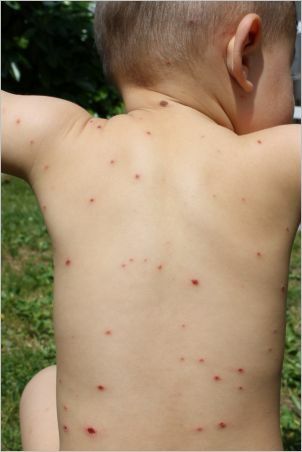 A child out by a river at dusk is likely to be bitten by hordes of mosquitos, and he might have a spotted face and arms for a week after. Bee stings are large and painful, and ants deliver quick, stinging bites. Avoid insect bites by using child-safe insect repellents and keeping the windows of your home closed at dusk. If your child has been bitten you should encourage him not to scratch. A mosquito bite, or instance, will disappear in a few days if it is left alone but can hang on for more than a week if it is scratched or rubbed. Insect bites are only dangerous if your child has a serious allergic reaction; if you see any signs of that, such as difficulty breathing or a fast heart rate, you should call your doctor or visit the emergency room immediately. Impetigo is a common and very contagious infection that is often seen on the faces of little children. It is not dangerous and will go away on its own; you may find it more embarrassing than anything. Non-bullous impetigo, the type most common in toddlers, begins with small red spots around the nose or mouth. These spots burst, leaving a golden yellow crust. When the crust has dried and falls off a red mark remains for a few more days or weeks. Since impetigo is very contagious you need to encourage your toddler not to scratch his sores. He may be very itchy; but scratching will make the infection spread. Wash his hands with soap and water after he touches the rash. Impetigo usually gets better by itself, but using antibiotic cream may reduce the risk of infecting others and speed recovery. Again, this is not medical advice, and nothing can substitute for a chat with your doctor about the toddler skin rash your little one is dealing with. My hope, though, is that this page will leave you better informed about toddler skin rash, and better able to understand what is happening when you see that worrying toddler skin rash on your toddler’s smooth skin.